Did you know you should really be reviewing your mortgage every two or three years? Or that you can find tax deductions specific to your job on the ATO website? 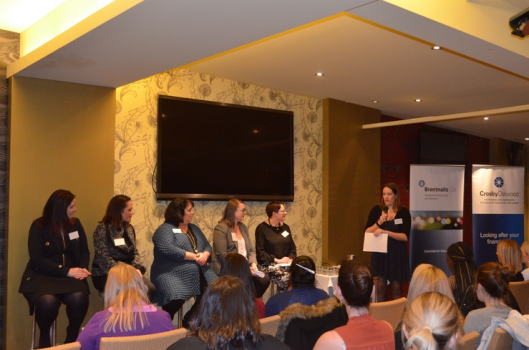 These were the kind of financial tips Spence Ladies picked up from the expert panel which presented at our latest event at the Hackney Hotel. Five leading women in the finance industry gave their time to answer questions on the most pressing money matters facing our members. Some of the main takeaways? Remember your my.gov.au password – you need it for everything! Former Spence Club Treasurer Sally Storey (Partner at Brentnalls SA Chartered Accountants & Advisors) and current Board Member Lisa Pritchard (Director at Holman Hodge Chartered Accountants & Advisors) for advice on how to make the most of our tax return, set a budget and conquer debts. Crosby Dalwood Managing Director & Senior Financial Advisor Helga Baxter for guidance on starting investing and ensuring we have the right insurance. Finance Prospects Director Jessica Arabia for that great tip about reviewing our mortgage conditions and talking us through property investment and car loans versus leasing. Statewide Super Head of Financial Planning Lisa Palmer for reminding us to know how our super contributions are being invested, the benefits of consolidating into one fund and boosting our balance by making extra contributions (if you can spare the cash!). The 36 women who came along – members and non-members – enjoyed hot canapes and networking time before and after the panel. All went into the running for a door prize bottle of wine donated by Brentnalls SA and $500 worth of accounting services from Holman Hodge and Crosby Dalwood. The Spence Club Board is working on our upcoming calendar of events. Keep an eye out for announcements via our Facebook, Twitter, LinkedIn and Instagram channels. If you’re not already in the Club, join us now to receive discounted tickets to upcoming events. NB: The information provided does not constitute advice. The information is of a general nature only and does not take into account your individual financial situation. It should not be used, relied upon, or treated as a substitute for specific professional advice.